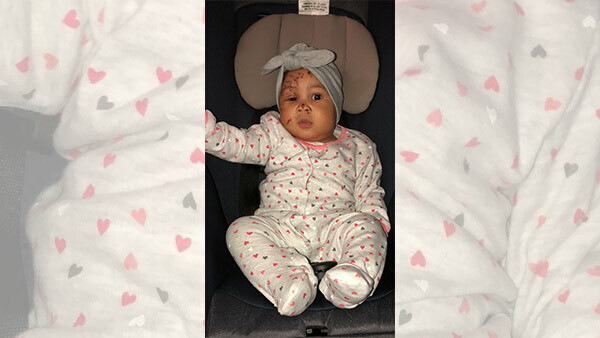 PHILADELPHIA -- A baby whose family members say was attacked by a raccoon inside a North Philadelphia apartment was released from the hospital on Christmas Day. Kenny McDuffy tells Action News his niece Journi Blake Rodgers is back with family and is doing well. McDuffy says the baby won't need additional surgeries. Action News was told the family was not returning to their home on the 2100 block of North 22nd Street where the incident happened last Wednesday. Watch the report from Jeff Chirico on Action News at 4 p.m. on Dec. 21, 2017. Journi's mother, Ashley Rodgers, says the raccoon attacked around 8:30 p.m. while she was in the bathroom and her baby was asleep on a bed. "I hear her screaming and crying. By the time I got to her she was off the bed across the room on the floor with blood all over her face," Rodgers said. Rodgers says Journi received 64 stitches during surgery and a rabies shot. Doctors say her eyesight wasn't affected. After the attack, animal control set a trap inside the home to capture the animal. Rodgers had just moved into her apartment days earlier.